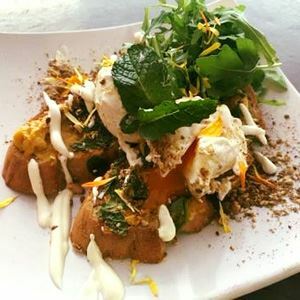 A short stroll down Collins Avenue from the luscious Cairns Botanic Gardens, along the fringes of the tropical city, is sustainably focused Village Café on Collins. 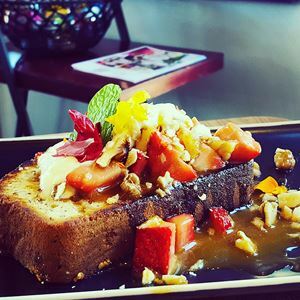 Loyal locals and the environmentally conscious gather to enjoy café fare in rustic, industrial surrounds of trendy wooden furniture and jet black bookshelves, along with an explosion of colour from a mural feature wall. For a light lunch, perhaps opt for the beetroot and vodka cured Huon Tasmanian salmon gravlax with lemon quark and salad greens, or for something hearty, delve into the Village Beef Burger with a grilled Tableland beef patty, cheddar cheese and Cape York Lilly Pilly chutney. If the schedule is tight, a Coffee Works Black Mountain coffee, roasted on the Mareeba Tableland, is a worthy excuse to stop by.